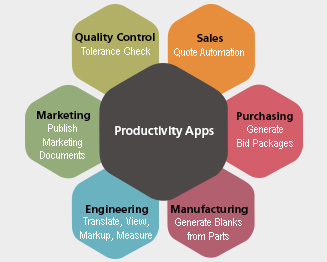 EnSuite includes a custom productivity apps framework that enables the creation of scripts to automate processes common in an engineering organization. Automation reduces the time taken to do the work and frees users to focus on more productive and innovative activities. Opening CAD files by showing only the data in context of use and hiding all insignificant data. This is particularly useful in files sent by OEMs to Suppliers which contain a lot of extraneous data that does not apply to the suppliers work. Computing bounding volumes, mass, and thickness of parts originating from any CAD and automatically populate Excel files used for quoting. Automatically adding thickness to models for faces with specific colors to create the blank model of the manufacturing part. Metalsa a global automotive chassis manufacturer reduced its quoting time by over 30% by leveraging the automation features in CCE’s EnSuite product. This has allowed the company to win more business besides freeing their engineers to focus on more productive and innovative activities.